So as the bourbon craze continues, it's high time we introduce you to its lesser known cousin rye whiskey, a spirit that's slowly gaining in popularity. I recently experienced a glass of Hochstadter's Straight Vatted Rye. With its milder, yet spicier tones, rye whiskey has now become my preferred drink of the two. If you are a whiskey drinker, I suggest you also give it a try. Although we currently have a nice selection of rye whiskeys already on our menu - i.e. Bulleit, Cody Road, Templeton and High West Double Rye - this week, we bring something new to our list. 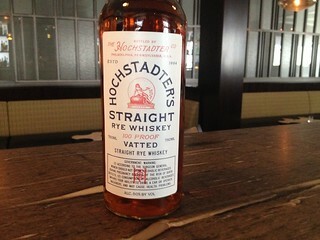 Hochstadter's Straight Vatted Rye is the first rye to use a "vatted" designation. This means it is as a blend of 5 straight rye whiskies from different distilleries throughout North America. They are from Kentucky, Pennsylvania, Indiana and Alberta, Canada and have been aged anywhere from 4 to 15 years. This blend is created at the Cooper Spirits distillery in Philadelphia that was created back in 1884. Hochstadter’s has an aroma of nutmeg, clove and toasted rye bread. The palate is rich, filled with notes of molasses and vanilla, and leads to a delicious finish accented by notes of sour cherry, orange zest and candied nuts. So what is rye whiskey? First of all, unlike bourbon, rye does not need to be made in the United States. However, in order to be called an American rye, the mash bill (blend of grains) must contain at least 51% rye, where bourbon is made from at least 51% corn. This gives rye more peppery flavors making it less sweet than bourbon. This is the signature flavor difference between the two. Now that you know what it's made of, what about proof and age? These are important when it comes to all spirits. Age - although rye must be aged in new oak barrels, there are no rules for how long it should be stored. However, when you get a bottle with no age specified, it is at least 4 years. Proof - American rye must be at least 80 proof and no more than 160. Now remember, we have all kinds of whiskey... Scotch, Irish, Canadian or American bourbon to name a few. Each of these whiskeys are native to respective countries. So what does a spirit need to be made of to be called an American rye whiskey? The origins of rye whiskey in the United States date back hundreds of years. Early European settlers brought with them the tradition of distilling excess grains from their farms into whiskey. For over a century, the production of rye whiskey centered around Pennsylvania and Maryland, where large numbers of Scottish and Irish immigrants had settled. Did you know that George Washington was one our nation's leaders in distilling rye whiskey? By the time he died, he was producing over 11,000 gallons of whiskey a year. As bakers began to use rye in breads, distillers began to use it in whiskey. Over time, that distinct spiciness makes it a great match in creating modern cocktails. We think you'll agree once you have a taste of Hochstadter's.